Glyko Nerantzi is a fruit preserve made with Seville Oranges when they are small and the seeds have not yet developed inside. The Seville, or the bitter orange (Citrus x aurantium) is believed to be a hybrid between the pomelo (Citrus maxima (Burm.) and the wild mandarin (Citrus reticulata Blanco). c) With its peels, when the fruit matures. Its blossoms are used to make citrus blossom water. The ripe fruit is used to make one of the most aromatic marmalades. It’s zest can be used to flavour cakes, etc., (just substitute lemon zest with Seville orange zes). Its juice is not bitter but sour. Therefore, we can use its juice to substitute lemon juice. In Cyprus, we use it to make Zalatina or pichti (aspic). The best period to make “nerantzi” is in July or early August. Instead of making the traditional recipe, I experimented and made it quite different, adding ginger as well. If you like ginger, you will love the combination of this bittersweet preserve combined with the peppery taste of ginger. Wash the bitter oranges and put them in a big bowl with water to cover them, for about one week. At the beginning the water will become green and at the end it will be much cleaner. Change the water twice a day. On the third day, change water again and bring to a boil and cook them for ten days. When they can be handled remove the seeds using a nail. Make a hole through the fruit from where the stem was and then using the head of the nail remove the seeds. Wash inside. Put them back on the heat and bring to a boil. Cook until a skewer inserted in the fruit pierces it easily and the fruit falls off. Remove them in a bowl with cold water and then drain. Put the sugar, honey, water, cinnamon stick, clove and the geranium leaves in a pot and bring to a boil. Simmer for about 15 minutes. Add the fruit and cook for 20 minutes. Set aside until they cool. Continue cooking for 10 minutes earch time, until the syrup has thickened. Roast the almonds in the oven for 15 – 20 minutes. Remove the fruit preserve and add 1 almond in the cavity. Put them back in the syrup and cook for only a few minutes. Add the lemon juice and when they have cooled store them in sterilized jars. If the syrup sets properly, the fruit will be perfectly preserved until you eat the very last one. If it does not set properly, then mildew will form on top. You don’t have to discard them as this can be fixed easily. At the end of the post you will find links, showing you what you hae to do. Scroll down for the second recipe. 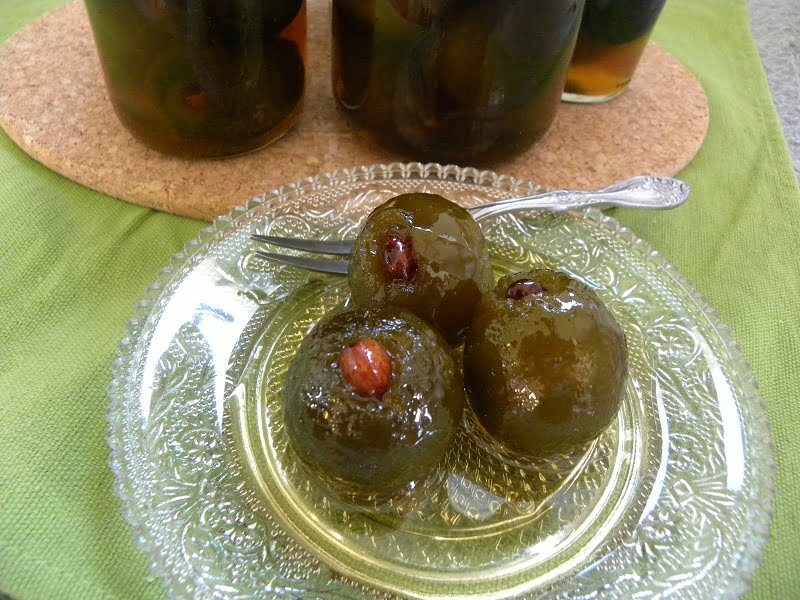 Last year, when we moved to Assini, although it was late August and the fruit was not very soft, I made some of this preserve again. Unfortunately as there were many things to do as we just moved, the recipe had to wait until now. This time, the procedure was different than last years’. I first soaked the fruit to remove the bitterness and then made the preserve. However, any method you choose, the result will be the same. The biggest pot I have is 11 litres. The cooking was made on a ceramic stove top which continues cooking until the ceramic cools. If you will be making it using gas, you will have to adjust the time of cooking. At the end the syrup was not enough to cover the preserve but even if I wanted to add more sugar and water from the beginning, it would not fit in my 11 litre pot, so I had to do it in two stages. This year I made the fruit preserve while the bitter oranges were very tender. Before preparing the preserve, cut one in the middle to see if the seeds have developed. If they have, you will have to remove them. As you can see in this picture they were very tender so I did not remove them. Wash the fruit and boil for ten minutes. Turn off the heat and wait until they can be handled. Remove the top part where the stem was and poke with a skewer to make holes in the fruit. Change the water twice every day for 5 days: You will see that discarded water becomes green. On 8th day drain and add layers of fruit and sugar. Add water and wait until it dissolves. Mix and make sure sugar has dissolved before putting it on the heat. First time bring at boiling point and boil for 20 minutes. Leave it on the ceramic stove until late in the afternoon. Add the peel of 1 lemon, the grated ginger, 20 cloves and 1 cinnamon stick 2 – 3 inches long. (If you like add ginger but this year I did not have any). Bring to a boil and cook for 20 minutes. Leave it on the stove top to cool until the following morning. Next day, boil again for 10 minutes or until the syrup sets. See links at the end of the post to know when the syrup is ready. At the end add the lemon juice and cook for 1 more minute. When it cooled it was placed in sterilized jars but syrup was not enough to cover them. To fix this, I made a new batch of syrup. I used 1 kilo sugar, 4 cups water, 1 cup honey, 1 lemon peel and 2 tbsp lemon juice. I boiled the syrup for 7 minutes. I then mixed it with the other syrup and filled the jars. Previous Post: « How can we tell if the syrup is ready? Ivy, your free to pick all the Nerantza we have around house in Halkidiki. Wish I had some. My neighbourhood is full of nerantzies but there is so much pollution I do not think they are edible. Unfortunately I have never made a lemon spoon sweet. The other day I ate the most amazine orange spoon sweet, with the fruit inside, quartered. You can try following the instructions I have for the bergamot spoon sweet. If you have a lot of lemons I have a lemon marmalade if you are interested in making some. How would you recommend making the whole orange spoon sweet? I think they are mandarin oranges. Do you have to remove part of the rind?